This report generates a summary report of revenue by category, taxes generated, payments applied, and discounts given within an entered date range. You can also enter a revenue goal and compare your goal to your actual revenue. Each section is explained below. Revenue is income that a company will receive from its normal business activities, usually from the sale of goods and services to customers. 1. Enter the Start Date. Items with revenue dates earlier than this will not figure into the Revenue, Discounts, and Taxes sections. Payments received earlier than this will not be listed in the Payment Breakdown section. Payments that were received outside this range, but applied to revenue dated inside it, are not listed..
2. Enter the End Date. Items with revenue dates later than this will not figure into the Revenue, Discounts, and Taxes sections. Payments received later than the end of this day will not be listed in the Payment Breakdown section. Payments that were received outside this range, but applied to revenue dated inside it, are not listed. Invoice dates and payment schedules are completely ignored on this report. 3. Choose your Location (This applies to accounts with multiple locations). 4. Enter a Revenue Goal (optional) Enter your target amount of revenue for this report period. It will be included in the report for comparison with the actual figures. 5. Include revenue that is not on invoices? By default, revenue and taxes that have been billed but not placed on invoices (and therefore are not yet payable) are included on the report. Select "No" to exclude them. 6. Group payments by payment method? Choose "Yes" or "No". 7. Include which credit cards? Allows you to choose a specific credit card to report on. 8. Show payments with which date in range? If you choose Date Received, you will see a breakdown of each payment that was received and each refund that was issued in the report range, regardless of when the payment was actually applied or unapplied to billed items. If you choose Date Applied/Unapplied, you will see a breakdown of each payment amount that was applied, unapplied, or refunded in the report range, regardless of when the money was originally received. 9. Filter by revenue category: If you choose a Revenue Category you will be able to see a report on how much revenue was generated for just that Category. Revenue by Category: Shows the amount of money that was billed within the date range you entered. 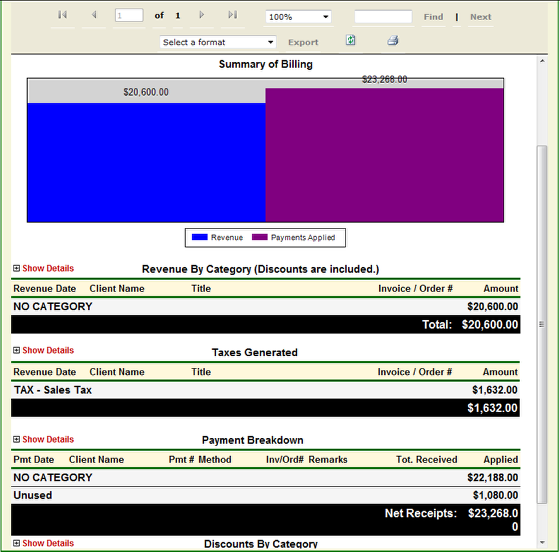 This section is based on the Revenue Date of each billing item. If the Revenue Date is within the selected date range, the billing item will appear in this section. Taxes Generated: Shows the amount of taxes that were added to billing items where the item’s Revenue Date is within the date range you entered. In order to correctly view this section a tax rate must be entered into your account. See How to Set up Taxes for your Account for more information. Payment Breakdown: Shows a breakdown of the payments received within the date range you entered. This section is based on the Payment Date of each payment. 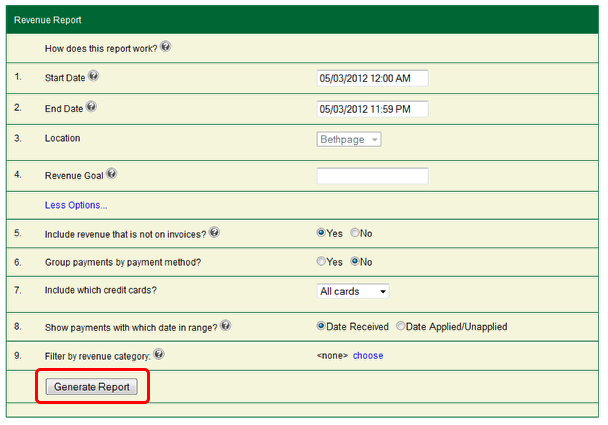 If a Payment Date is within the selected date range, the payment will appear in this section. This section will show you the amount of payments applied to an item, not applied to an item, and refunded. Discounts by Category: Shows the total amount of discounts applied to billing items where the item’s Revenue Date is within the selected date range. Click the "Show Details" on the report for more information.